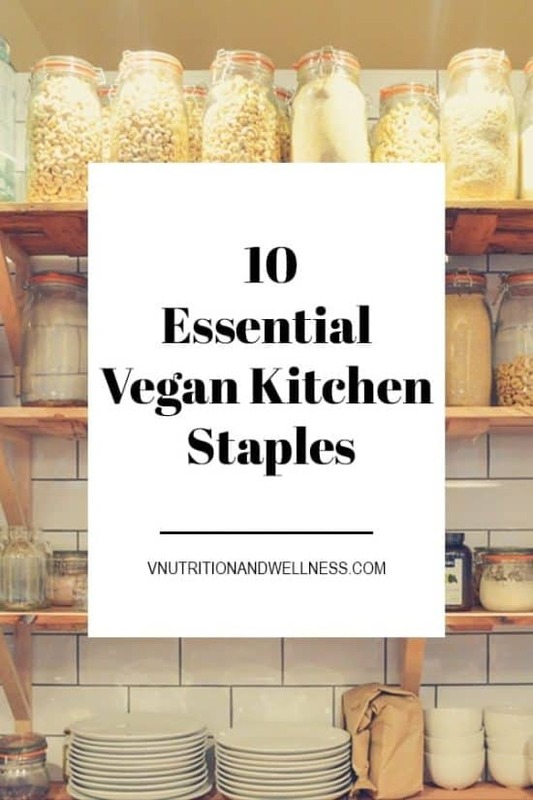 10 Essential Vegan Kitchen Staples - Be ready for any recipe! These 10 Vegan Kitchen Staples are some must-haves when going plant-based so you’ll be ready to take on almost any recipe! I sure have, especially when I first went vegan. 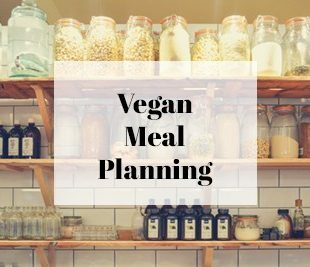 To help you if you ever experienced the same thing, I put together a list of vegan kitchen staples that I use and that I’ve seen in other vegan recipes too. This way you’ll be covered with the basics! 1. Non-Dairy Milks – I’m sure you probably have some in your fridge or at least have tried some before (if not, you’re in luck, they’re tasty!). There are nut milks like almond, cashew, and hazelnut as well as other kinds like soy, rice, hemp, coconut and flax. 2. Nutritional Yeast (aka nooch) – You might be asking yourself what that is or think yeast sounds gross – well it’s not – it’s delicious! Nutritional yeast is a biggie when you want to add a cheesy flavor to food and also adds an umami or savoriness to dishes. 3. Nuts & Seeds (and their butters) – There are so many nuts and nut butters to enjoy. I snack on peanuts, almonds, walnuts, and pistachios as well as hemp, sunflower, chia, flax and sesame seeds. I love peanut butter and almond butter for balls & smoothie bowls. Chia and flax seeds are great for thickening up recipes like my overnight oats or chia jam. Cashew butter is great for making dressings creamy and raw cashews are perfect for adding in that same kind of creaminess like in my Colcannon Soup and Vegetable Bean Casserole. Use in: snacks, sauces, dressings, soups, etc. 4. Tamari/Soy Sauce – Because I make a lot of Asian foods many recipes will call for it but I use it well beyond Asian recipes to add extra flavor. A tasty fusion recipe that I use it in is my Teriyaki Tempeh Tacos. 5. Ground Flax Seeds – Did you know that you can make an egg substitute with flax seeds? It’s true! To make one “flax egg”, mix 1 TB of ground flax seeds with 3 TB of warm water and let sit for about 10 minutes. When storing flax you have to keep it in the fridge because the seeds can get rancid in heat. One of my readers told me she stores flax seeds in the freezer and grind the seeds when she needs them which is a great way to keep the nutrients intact! Flax seeds contain Omega 3s so they’re good for you too. Use in: baking muffins, cakes etc. 6. Fresh Lemons & Limes – There are always lemons and limes in my fridge. I feel like lemon can be added to almost anything – sweet or savory. I have a glad of warm lemon water every morning when I wake up becasue it’s a nice and refreshing way to start the day. I also use it in my Lemon One Pot Pasta (one of my most popular recipes! ), my Lemon Overnight Oats, and in countless dressings/sauces. Lime is a wonderful flavor addition to Mexican or Asian dishes/sauces like my Walnut Meat Tacos with Lime Cashew Cream or my Easy Peanut Sauce. 7. Canned Beans – Canned beans are a must for vegans – they add lots of fiber and protein. Plus they’re easier and quicker than cooking dried beans. My favorites are chickpeas. I use them in my Roasted Tomato and Chickpea Soup) and save the chickpea brine (aka aquafaba) for recipes like my sriracha veggie burgers. I always have a can of white beans and black beans on hand as well. 8. Hot Sauce – I love hot and spicy dishes so I always have some kind of hot sauce on hand. Even if you’re not a hot/spicy person yourself, adding a bit will add a depth of flavor to food. The ones I always have on hand are sriracha, Frank’s Red Hot, and sambal oelek (chili paste – I use this in my Spicy Tofu). Use in: almost anywhere that needs a bit of spice! 9. Vinegar – As I said before, I like to make most of my own dressings, so vinegar is a must for those. I also use it in many of my sauces to add a bit of acidity when I’m not using lemon juice. Some of my favorites are apple cider, rice wine, and balsamic. 10. 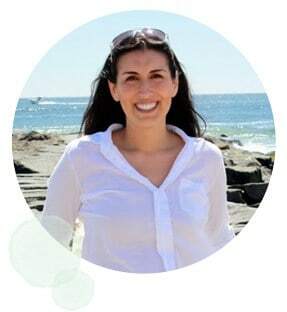 Gluten-Free Grains and Flours – I’m mostly gluten-free now (after lots of trial and error of what works for my body) so I keep many gluten-free whole grains in my house such as quinoa, amaranth, buckwheat, and millet. Some of my favorite recipes on the blog include quinoa and brown rice such as my One-Pot Lentil Quinoa, Green Power Bowl, Buffalo Quinoa Balls, and Vegetable Bean Casserole. I also like to keep gluten-free flours on hand. Some of the GF flours I use are almond, chickpea, and quinoa flour. I used two gluten-free flours in my banana nut muffins. Besides baking, I use these types of flours in my protein balls like my Cookie Dough Balls, as a thickener for my Mushroom Gravy, and for coatings like on my Popcorn Tofu. 11 (bonus). Spices/Herbs/Seasonings – I tried but I couldn’t end the list at just 10 because herbs and spices are an essential part of any vegan kitchen. Fresh herbs are add so much flavor and depth to dishes while dried spices are perfect for sauces, dressings, and marinades. My cupboard is filled with all sorts of spices but my essentials are garlic powder, onion powder, sea salt, black pepper, turmeric, paprika, cumin, cinnamon, hot pepper flakes, Italian seasoning, and chili powder. I know when I make a recipe I’m good to go having all these on hand. Like my Vegan Kitchen Staples!? It would be so wonderful if you could give it some love by sharing! This is such a great list! Getting that pantry and fridge stocked is so important when you’re going vegan! This is a great list! I have all of them in my kitchen right now! Thanks Dianne! I knew you would! These are great suggestions, Mary Ellen! It’s important to keep a well-stocked kitchen. Thank you so much Amy! Being well stocked makes things so much easier! Great list – I am hard put to add to it though I think I would have to add either smoked paprika or liquid smoke – it gives a meaty flavour and is a must for the tofu bacon that we make a lot. Do you buy your lemons or get them from your tree or friends. We went to a shop yesterday that said you could get $10 credit with a box of fresh lemons and my mum told me that they are hard to come by right now though she has lots on her tree – actually I need to water my tree as we have some lemons growing there and I can’t wait for them to ripen. That would be a great addition Johanna! I haven’t used much liquid smoke in my recipes yet but I’m going to purchase some after you suggested it. I bet it really is good on tofu bacon! I have to buy my lemons. 🙁 I wish I had a lemon tree around – no one I know has one actually. I live in right outside NYC though so I don’t think they’re too popular here. I’m so jealous that you can have them any time they’re ripe! Very nice list. I really miss any one of these ingredients when I run out. Great list! I keep almost all of this on hand too! Canned beans are a must for me! Great list! I don’t know if I could narrow down my faves to just 10 though. Sooo many things I couldn’t live without! It was so hard Jenn! I’ll have to do other lists to add in more favorites! Those are my total must-haves! 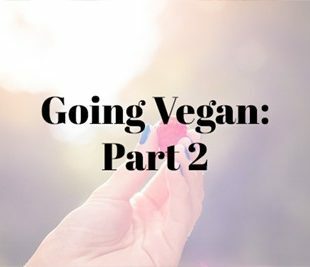 Such a helpful post for all the new vegans around at the moment! All of these are my staples too, except number 10. I was never a fan of mayo, sour cream or cream cheese before I was vegan so don’t really look for them now. Tamari and nutritional yeast are my top 2 ingredients. Hot sauce is a close third! Thanks so much Mel! Yeah, I wasn’t much a fan of them either. I kind of only use them for quick sauces and stuff because they’re so easy. Nooch, tamari and hot sauce are total must haves! 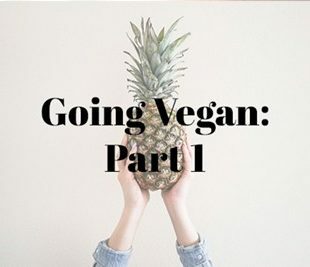 This is such a great list and is so helpful to vegans (especially newbies). I love that you added hot sauce to the list. It’s a must for me, too! I’ve got them all! One of my favorites are hemp seeds—I use them almost every day! And garlic and onions—my husband and I joke that we don’t know how to start a meal without first sautéing the two of them together! I figured you would! Yes, hemp seeds are amazing. I’ve been using them more and more. Me too, every recipe I make feels like I saute garlic and onions! Great staples! I wish I would have had something like this when I went vegan. Especially when I first saw a recipe using nutritional yeast. I was like… wth is that??? Haha. I know, I would have loved this going vegan. Nutritional yeast had me so confused. Little did I know how obsessed I’d be with it!